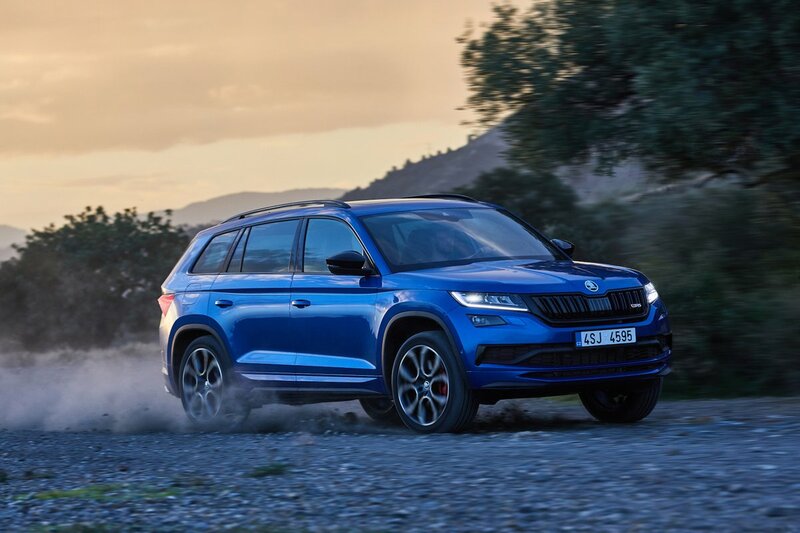 Skoda Kodiaq vRS Performance, Engine, Ride, Handling | What Car? 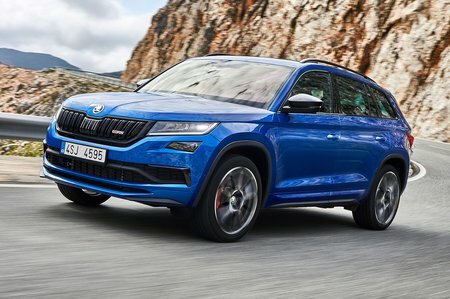 Although the Kodiaq vRS, with some persuasion, can be made to launch hard from a standstill, we’d describe it as nippy rather than outright fast. Put your foot down at speed and while it has plenty of pace for overtaking, you never feel thrown back in your seat. You'll need the smaller, five-seat-only Cupra Ateca for that. But it’s worth remembering that this is nearly two tonnes of SUV with a driver on board, not some lightweight special. Its 237bhp diesel certainly feels like a step up from the 187bhp version and suits the vRS’s sensible performance approach very well indeed; it’s still quicker than the majority of cars without ever being scary. While we’re on the subject of engines, four-cylinder diesels are not known for being particularly tuneful, so Skoda adds something it calls Dynamic Sound Boost. This, in effect, augments the car's natural exhaust note with an artificial soundtrack. The result is a low grumble that’s slightly reminiscent of an old-school American V8 that gets progressively more aggressive as you go through Comfort, Normal and Sport modes. It’s not the worst fake noise we’ve heard, but we were pleased to find out that it turns off in Eco mode or by fiddling with Individual mode, because it can get irritating on the motorway. But, we hear you cry, what of the handling? It might be a big old lump, but in addition to those adaptive dampers and big wheels with wide tyres, you get what Skoda calls Progressive Steering. This gets faster the more you turn the wheel, so the vRS feels stable in a straight line but requires less twirling of the wheel for tight bends. Although precious little information filters up from the front tyres to the steering wheel, we doubt many will complain, because the steering is so direct and precise. Grip levels are predictably high, but the Kodiaq vRS is also surprisingly well balanced; you can really feel power being directed rearwards to stop it from just pushing wide at the front. That means you can confidently carry plenty of speed on a twisting stretch of road and even have some fun in the process. This doesn’t come at the expense of ride comfort, either. Although the vRS is firmer than smaller-wheeled Kodiaqs, there’s still enough compliance in Comfort and Normal modes to deal with all but the craggiest of road surfaces.